It's officially camping season in Florida. We know you're ready to get on the open road, but before you do we have 5 RV camping hacks you won't want to miss. It'll make your experience more enjoyable and your RV neighbors will think you're the smartest campers on the block. You don't even have to give us credit! You can get these simple badge holder clips at any office supply store. They are great for holding name tags, badges and backstage passes to your shirt. 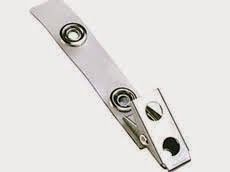 They are also great for hanging outdoor lights around your RV awning. Don't bother spending tons of money on clips when these will do the job. No one will know the difference and you'll save loads of money on your new decor so you can upgrade to the fancier hanging lights. Actually, sometimes it's okay to be a square! If you're running out of room for food storage in your RV, consider switching things in round containers to reusable square containers. They stack and store much easier, plus it's a great excuse to use a label maker. 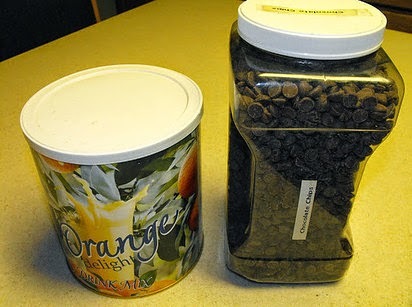 Now we're wondering what the plan for these chocolate chips is. Cookies, anyone? 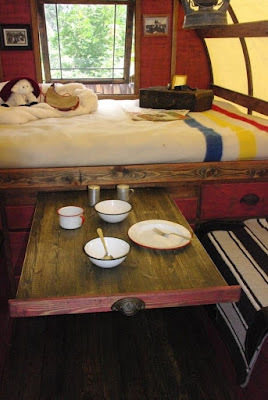 Decorating your RV doesn't have to be expensive. 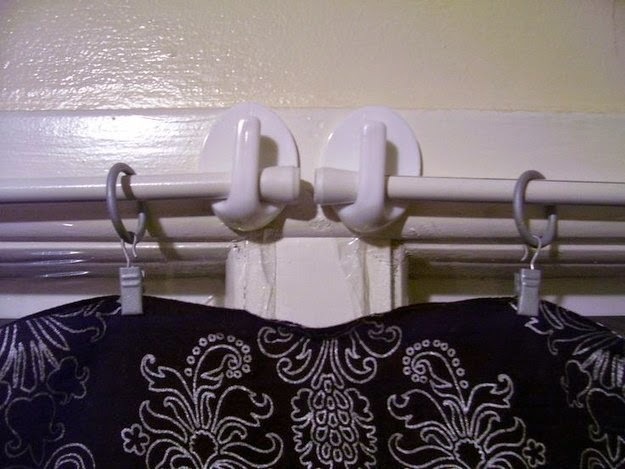 Hang curtains in your RV with command hooks. You can even paint them to match the curtain rods, your wall or the curtains themselves. Now that's decor done right. This idea is basically genius. 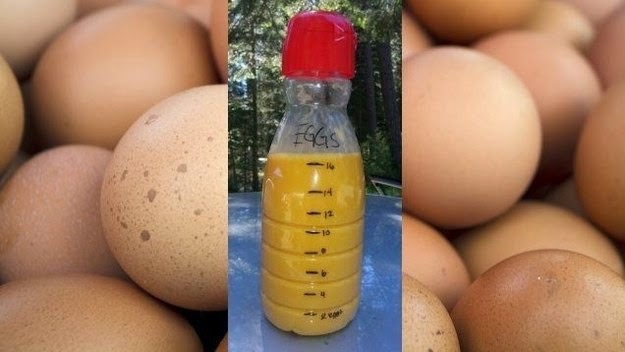 Grab an old coffee creamer bottle and wash it out (no one likes french vanilla eggs), and then crack eggs into it. As you crack the eggs, take a marker and mark how many eggs have gone in. This way you can make the perfect amount for everyone without ever dirtying up a bowl. Breakfast is served. We're pretty sure you'll be the most popular person at the RV park with these ideas. Speaking of hanging out, most people forget the space-saving awesomeness of hanging things. 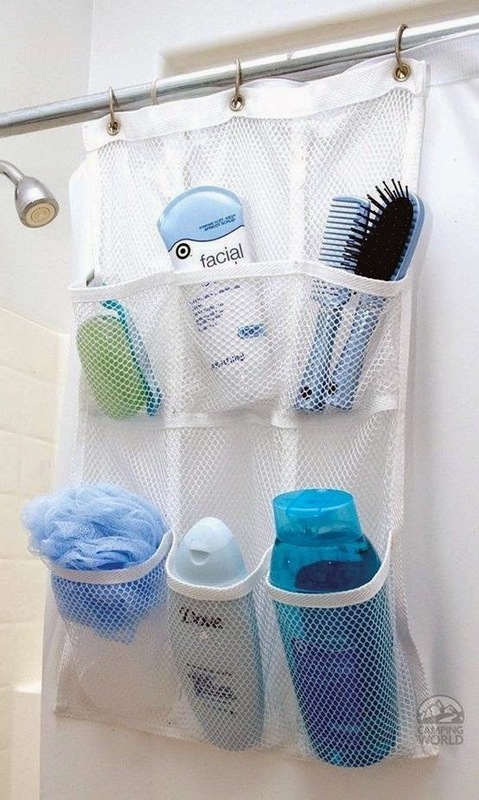 Use this mesh storage system in your shower, behind the door in your bathroom, in your bedroom or anywhere something can hang. It's a great place to store odds and ends, plus it keeps them out of the way. It's a win-win all around. What amazing RV camping hacks do you have? Share them with us! DIY is in style. It's cheap, it's eco-friendly and it gets you moving. 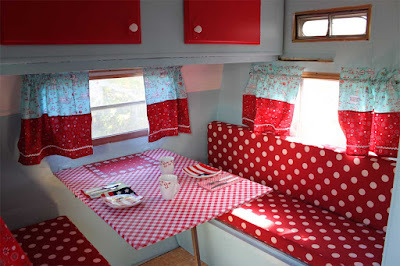 You've got the RV, now let us give you some RV remodeling ideas you can do yourself. 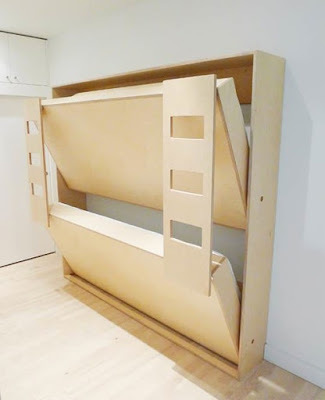 Invite along the grandkids or friends with these hideaway bunk beds. When no one is using them they store away so you can have the extra living space. These retail for nearly $4,000, but you can DIY for much less. Paint cool designs on the outside so these look good even when hidden. Old cushions can make any RV look drab. Whether you're a master sewer or just starting out, this DIY will be perfect for you. Use this no sew cushion tip to recover those seats and create a space you love. Have breakfast in bed or a quick meal with this slide-out table. You can install it under the bed easily and use it for a lap top too! It's the perfect way to create secret space in your RV. Plus it would be a fun weekend DIY project.